The popularity of ‘Hibiscus Cooperi’ dates back to the Victorian era. ‘Hibiscus Cooperi’ has showy variegated foliage splashed with various combinations of white, pink and green, as well as a compact growth habit. The red flowers appear at the tips of the branches and are up to 10cm inches across. Pinching out tips of stems in spring and summer helps to increase flower production. 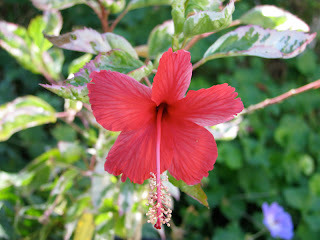 There are a number of cultivars often associated with ‘Hibiscus Cooperi’. The plant in the photo at left is ‘Snowflake’. There are also other cultivars, like ‘Snow Queen’, ‘Roseflake’ and ‘Hummels Fantasy’― an even more compact cultivar with lots of white variegation in the leaves. It appears that there may possibly be some confusion regarding the plant most commonly labeled ‘Hibiscus Cooperi’ in the U.S. As compared with some historical images, it is probable that what is now labeled as ‘Roseflake’ (aka ‘Carnival’), may be closer to the historical descriptions and images of ‘Hibiscus Cooperi’. Historical Information: The history of this plant is somewhat unclear, but based on scattered bits of information, it is possible this may actually be a naturally occurring species (or subspecies of Hibiscus rosa-sinensis). Apparently, back in the late 1800s, the location of this Hibiscus' homeland was in question —three or more historical references list its origin as New Caledonia, others indicate southern Australia. An old German reference says it was discovered by Sir Daniel Cooper in New Caledonia and introduced by him to England. (Neue allgemeine deutsche Garten- und Blumenzeitung, Volume 21, Otto & Mettler,1865). 'Hibiscus Cooperi' is a cold-tender plant, much more so than many other Hibiscus rosa-sinensis cultivars. In my opinion, this lends further support to the claim that it is indigenous to a locale with a more tropical climate than southern Australia (see historical references below). Historical Reference: Hibiscus Cooperii, Sir Daniel Cooper's Hibiscus. We cannot be wrong in selecting for a place in this series Hibiscus Cooperii, for it has leaves that are exquisitely beautiful, and in its season it is crowned with gorgeous flowers. he particular subject of this notice is a native of the hottest parts of the Australian continent, where it was first discovered by Sir Daniel Cooper, Bart., of Woollabra, near Sidney, and some time treasurer to the Royal Horticultural Society of London. The plant is of delicate constitution, but when properly treated grows freely, and is extremely beautiful. The young stems are of a deep red colour, and the footstalks of the leaves, and the stipules that accompany them, are of the same colour. The leaves are lanceolate or elongate-ovate, wedge-shaped at the base, pointed at the apex, irregularly bluntly toothed. They vary considerably in colours, but the prevailingtints are carmine red, with patches of creamy white on the outer parts of the blade, with more or less of light and dark green dappled in the line of the midrib. Numerous as are plants with highly-coloured leaves, we have few that equal this in the abundance and richness of its tones of red. When it flowers, however, surprise must precede admiration, for the flowers are not surpassed in splendour by any other species of this noble family. The flowers usually exceed six inches in diameter; they present no peculiarities of structure, being of the ordinary Hibiscus type, the long narrowish petals being rather widely separated. The colour of the petals is an intense carmine scarlet, but the base of each is blush, which breaks into the scarlet in delicate veins, the centre of the flower being blackish crimson. The plant has at least one defect, and that is extreme shyness in producing flowers: this, however, is a common defect of new plants, owing to their being kept in a constantly growing state, for purposes of propagation. When quite established it will probably flower much more freely than it has done hitherto. Historical Reference: HIBISCUS COOPERI, Le catalogue de M. James Veitch nous apprend que cet arbuste a été rapporté de l'Australie méridionale par sir Daniel Cooper, Bart., et qu'il portera de grandes fleurs rouges. Il aurait été dédié à ce gentilhomme— mais nous ignorons absolument par quel botaniste et nous ne savons dans quel ouvrage il faudrait en puiser la diagnose. Jusqu'à ce que la science ait parlé, nous nous bornerons à dire qu'il nous parait peu probable que la patrie réelle de cette plante soit la Nouvelle-Galles du Sud, au climat àpre; elle dérive, selon toute apparence, de quelque contrée autrement favorisée des dieux, la Nouvelle Calédonie par exemple. Cette supposition est plus fondée que l'assertion hasardée de ces exposants, lesquels à défaut du nom réel de la patrie font venir cet Hibiscus qui du Pérou, qui du Japon, points du monde suffisamment distants de Sydney, où sir Cooper l'a embarqué. Il ne saurait d'ailleurs endurer le climat du Japon. Nous cultivons l'Hibiscus Coopcri en serre tempérée pendant l'hiver. Durant l'été sa place est en plein air, au grand soleil. On remarquera que notre planche a été faite d'après un bien maigre échantillon; bien taillée, bien menée cl touffue, cette plante produit beaucoup d'effet. Sa multiplication par voie de boutures est aussi facile que celle de la plupart de ses congénères. L. VH. Translation: HIBISCUS COOPERI, The catalog of Mr. James Veitch tells us that this shrub was brought back from South Australia by Sir Daniel Cooper, and that it bears large red flowers. It was dedicated to this gentleman, but we know not by what botanist and we know not which work to draw out the diagnosis. Until science has spoken, we shall simply say that it seems unlikely to us that the real home of this plant is the harsh climate of New South Wales. It derives, apparently, from some otherwise favored land of the gods, New Caledonia, for example. This assumption is more founded than the proposition of these exhibitors, which lacking the actual name of the country this Hibiscus comes from —Peru or Japan, parts of the world distantly remote from Sydney, where Sir Cooper embarked. It also can not endure the climate of Japan. We grow Hibiscus Cooperi in a temperate glasshouse in winter. During the summer it is placed outdoors in the sun. Note that this illustration was made from a very sparse sample neatly trimmed, acheiving a bushy plant, producing much effect. Its propagation through cuttings is easier than most of its congeners (a member of the same taxonomic genus as another plant or animal). L. VH.